The Fellowship was fortunate enough to obtain a copy of STONE OF TYMORA from Wizards of the Coast. R.A. Salvatore and Geno Salvatore wrote this novel. Maimun is an orphan, and he’s been passed around all his life. Now he’s twelve, his latest guardian has been killed, and he’s been attacked by a nasty demon-like creature named Asbeel. So he flees, and spends time as a sailor, a pirate, a scholar, and even hobnobs with some of the better-known characters in the Forgotten Realms. Ultimately he decides to destroy the religious artifact that has made his life so difficult, but even that really doesn’t make it any less interesting. This is the first of a new wave of Forgotten Realms novels coming out this fall, and if it’s any indicator, we’re in for a great ride. 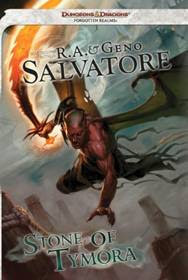 STONE OF TYMORA is available now in bookstores everywhere or by order from wizards.com.